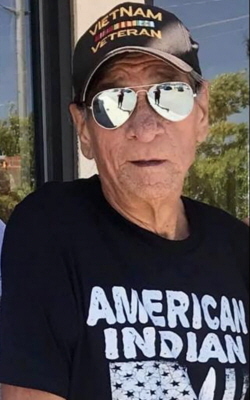 George Wade Wittman Jr. passed away February 8, 2019, surrounded by his family and loved ones. George was born in Okmulgee, Okla. December 29, 1946 to George Wade Wittman and Irene Elizabeth Marshall Wittman. He was preceded in death by his father, mother and grandmother Polly Ah-Loh-Quan Long. George is survived by his wife, Cecelia Wittman, of Bixby, his sons George Legus Hummingbird, his wife Lori, children Zahayfa Echota and Waleli, of Kiefer, Eli Benally and daughter Ava, of Kellyville, Cody Benally of Glenpool and Jeremiah Joseph Wittman and son Gunner of Bixby. George and Cecelia were blessed with three Godchildren Matthew and Shelby Osceola of Glenpool and Sonya Seber of Coweta. He is also survive by his brothers Richard Ray Whitman of Oklahoma City and Joe Dale Nevaquaya of Norman, his only living uncle, Milo Yellowhead of Grants, New Mexico, as well as a host of nieces and nephews. George came to live with his Grandmother in Gypsy, Oklahoma, and he and his younger brothers were raised, loved and adored by the gentle hand of their grandmother. Their first language was Euchee. She raised the boys to become self-reliant. They later moved to Bristow where George attended school and attended Muttleloke Methodist Church where he played baseball. After high school he enlisted in the U.S. Navy on March 11, 1965. He went aboard the ship U.S.S. Clarion River LMSR 409 that took him to Vietnam where he earned the nickname “Zippo” due to the use of the Flamethrower and the Twin 50’s. He completed three tours in Vietnam and returned home as a combat Veteran on February 14, 1969. Through the 70s he enjoyed his life as an active member of the American Indian Movement. George and Cecelia started their life together in 1985 and raised four boys. He retired from American Airlines after 20 years. George and Cecelia later moved to Bixby, Oklahoma. George was a proud member of the Polecat Ceremonial Ground where he built lifelong friendships through the Polecat and Duck Creek Ceremonial Grounds as well as the Duck Creek Community where they lived. George loved his wife, his children and grandchildren, family and extended family, as well as camping and fishing on their land in Colorado. George loved His country, the American Flag as well as Johnny Horton and John Fogerty. His life and love has been engraved in his family’s hearts. To send flowers or a remembrance gift to the family of George Wade Wittman, please visit our Tribute Store. "Email Address" would like to share the life celebration of George Wade Wittman. Click on the "link" to go to share a favorite memory or leave a condolence message for the family.